Starting Thursday we will have a nightly greeter who will welcome people when they come to rehearsal. This person should arrive around 6:40 and have their nametag on. I have taken the first week and Al has taken the second. Please sign up to be a greeter. We introduced two new songs last week. For this week, we will continue with the new songs and run through the entire song. Please work on them this week. We are restructuring the rehearsal schedule. The first part of the rehearsal will involve learning of new songs and polishing the repertoire. This will be the detail work for the evening. After business and break we will run 5-6 repertoire numbers so that John can evaluate where he needs to emphasize. This segment may be directed by someone other than John so that he can listen and take notes. Let us know what you think after we implement this change. 4/26-28 – Spring Contest in Iowa City. We have been asked if we would be able to help with the event. We may also be the mic testers. Stay tuned for more information. 5/2 – Cookie Festival in Iowa City. This is a regular chorus rehearsal night, so we would like everyone to represent the Harmony Hawks at this event. 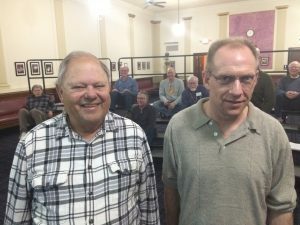 Jim (Shooter) Sjostrom was honored for his renewal at last week’s rehearsal. Jim has 21 years of service with the chorus and has sung bass in three quartets: New A Chord, County Corridor, and Timeless, his current quartet. 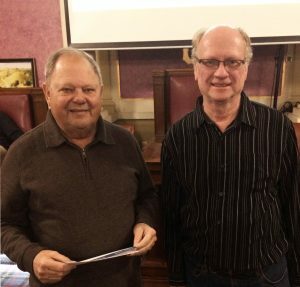 Tom Read presents Jack Ray with his membership renewal at rehearsal Feb. 14. Jack has been a member of the chorus for seven years and served as Chapter Development VP the past two years. He was part of Country Corridor quartet for three years. Jack loves performing both as a chorus and quartet member. 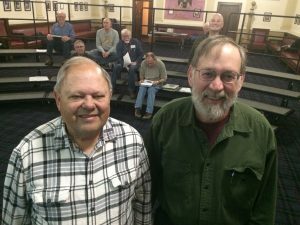 Tom Zuber, honored for his renewal last week, has been a member of the chorus and the Society for 55 years. His seven Men of Note awards is one of most in the chorus. He has served as a Board Member at Large for two years, and as helped with chorus communications and contest coordinator for many years. 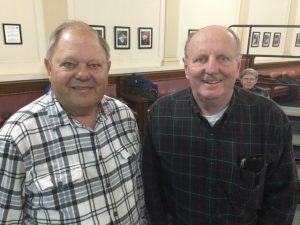 Steve Aldrich, honored last week for his renewal, has been a chorus and Society member for 12 years. He has served as uniform chairman for the past four years as well.